Everyone knows that huskies love the cold, so when one tiny sled pup was looking for a place to lie down, she naturally picked the coolest spot in the house. Little Luna was just 8 weeks old when owner Angela Rodriguez found her curled up in the fridge - a moment the YouTube user managed to catch on camera. Luna's behavior may seem odd, but she's hardly the only husky to discover the appliance's frosty wonders. 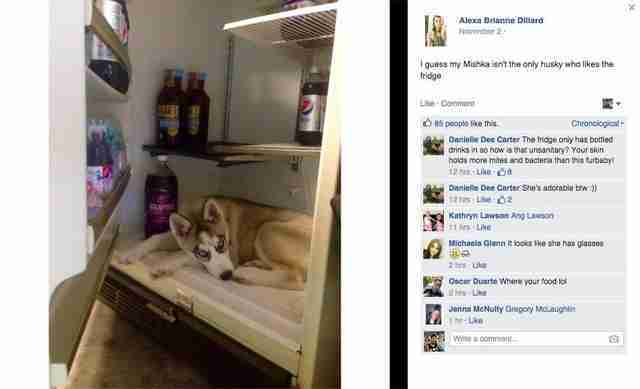 "I guess my Mishka isn't the only husky who likes the fridge," commented one dog owner. "It's a husky thing!" wrote another. Luna, however, eventually outgrew her unusual chill out zone. According to Rodriguez, the husky now hangs out in her ice pool when she wants to get cool.